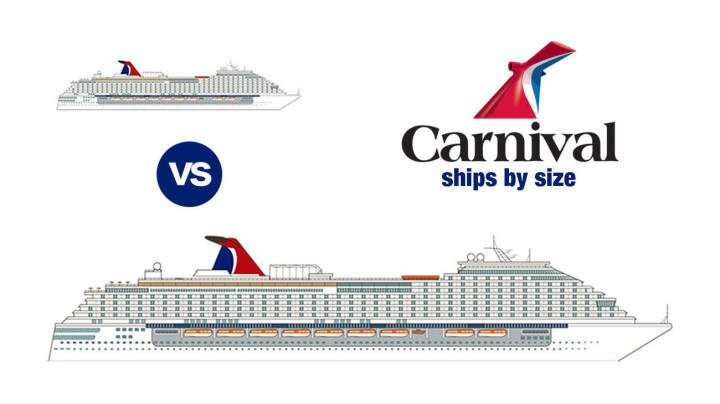 Carnival Ships by Size (2019)… how big is yours? Below you’ll find a complete list of Carnival Ships by Size. From their very first ship (Carnivale – 1956) to their latest planned 2020 cruise ship, the Carnival Reflection. You’ll find a massive difference between Carnival’s largest and the smallest ships in their fleet. To say, “my how you’ve grown” would be an understatement. When comparing by “gross tonnage,” this difference in ship size is almost 10x from largest to smallest! First, we have to clear something up. We’re measuring Carnival ships size by the metric, “Gross Tonnage.” This always causes a bit of confusion amongst our community members. It’s not simply “weight” that determines this size measurement. The definition is technical and boring, but we’ll provide it anyway. Gross Tonnage is a nonlinear measure of a ship’s overall internal volume. Gross tonnage is calculated based on “the moulded volume of all enclosed spaces of the ship” and is used to determine things such as a ship’s manning regulations, safety rules, registration fees, and port dues, whereas the older gross register tonnage is a measure of the volume of only certain enclosed spaces. We told you it was boring! So why do we use this measurement to determine Carnival Ships Size? As noted above, it’s used for safety rules and whatnot. As such, it’s prevalent. Every passenger cruise ship will have this measurement. That makes it easy to compare ship size across ship, class, line and more. Ok, we’re done with today’s maritime measurement course. Here’s the good stuff. Click above to pin this Carnival Cruise Ships by Size Infograph to your cruise planning board, so you can refer back to it when choosing your next ship! That’s every Carnival Cruise Ship currently active in their fleet, along with a couple newer ships coming down the pipeline. You can see the vast difference in ship size. This is particularly dramatic when looking at Carnival’s newest planned ship, the Carnival Panorama! Here’s a visual representation showing the smallest of the fleet vs this new behemoth. The experience on these two ships will be completely different! On the upcoming Carnival Reflection, you’ll be lucky to experience half of the venues on the ship. Whereas the smaller ships offer a more quaint and personal experience. In just a day or two, you’ll have your bearings and likely a fixed routine on these ships. Which is better? That’s all going to depend on personal preferences! Here’s a menu of all Carnival Ships by Size. Click on any for quick access to ship stats for that vessel. Below we’ve listed all Carnival Ships by size, including a bit more info. You’ll find the following metrics. We hope that the above list of Carnival Ships by size help you to find your ideal cruise. If you enjoyed this, feel free to check out our post, Carnival Ships by Age. Please use the “Share” buttons below to help other Carnival fans find this sizing info!